Sassy Stephanie Plum loses her job as a lingerie buyer and ends up working for her uncle Vinnie as –what else? — a bounty hunter. Never mind that she has no idea what she’s doing. And that she had a brief high school fling — and a resulting love/hate relationship — with the guy (who’s now a hunky ex-police officer accused of murder) she’s attempting to bring to justice. The people in Stephanie’s life are colorful, too, which adds to the fun: her lovable but kooky Grandma Mazur; her pet hamster, Rex; her super-hot bounty hunter mentor, Ranger; her street-smart “snitches” and the elderly tenants in her apartment building. This tale about zany adventures in Trenton, New Jersey, is a rollicking good read that you won’t want to put down. ***When you’ve finished it, skim the synopses of the next volumes in the series — published in the back of the book. They’re very intriguing, and build on the characters in this kickoff book. You will definitely want to read more! 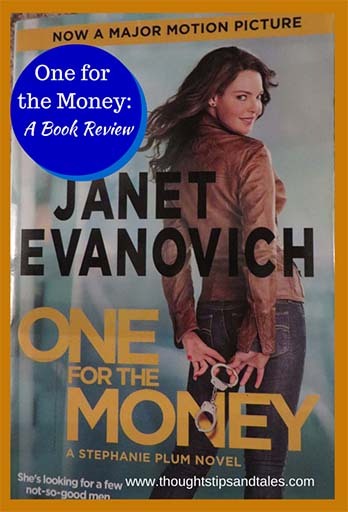 This entry was posted in book review, books, favorite books, Janet Evanovich, One for the Money, Stephanie Plum and tagged favorite books, Janet Evanovich, one for the money, Stephanie Plum. Bookmark the permalink.